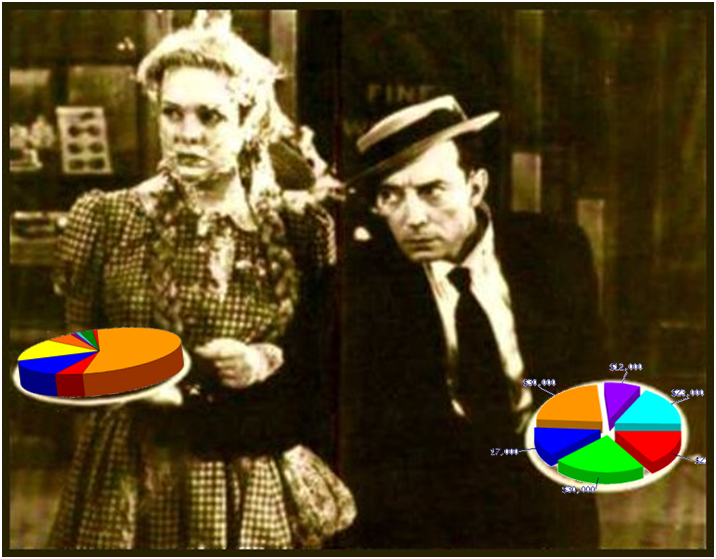 Should the Pie Chart Be Retired? The ability to create and interpret visual representations has been an important part of the human experience since we began drawing on cave walls at Chauvet. Today, that ability—what I call visualcy—has even greater importance. We use visuals to discover how the world works, communicate our discoveries, plan efforts to improve the world, and document the success of our efforts. In short, visualcy affects every aspect of program design and evaluation. The evolution of our common visual language, sadly, has been shaped by the default settings of popular software, the norms of the conference room, and the desire to attract attention. It is not a language constructed to advance our greater purposes. In fact, much of our common language works against our greater purposes. An example of a counterproductive element of our visual language is the pie chart. Consider this curious example from the New York Times Magazine (1/15/2012). 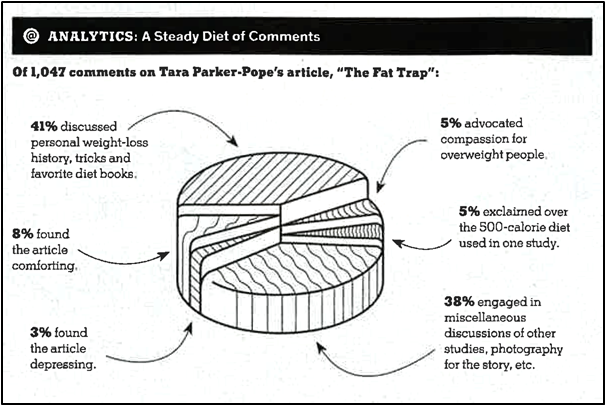 This pie chart has a humble purpose—summarize reader responses to an article on obesity in the US. It failed that purpose stunningly. Here are some reasons why. (1) Three-dimensionality reduces accuracy: Not only are 3-D graphs harder to read accurately, but popular software can construct them inaccurately. The problem—for eye and machine—arises from the translation of values in 1-D or 2-D space into values in 3-D space. This is a substantial problem with pie charts (imagine computing the area of a pie slice while taking its 3-D perspective into account) as well as other types of graph. Read Stephanie Evergreen’s blog post on the perils the 3-D to see a good example. (2) Pie charts impede comparisons: People have trouble comparing pie slices by eye. Think you can? 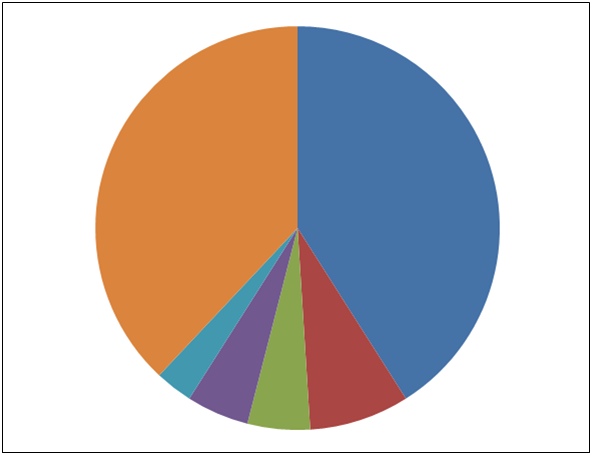 Here is a simple pie chart I constructed from the data in the NYT Magazine graph. Which slice is larger—orange or the blue? Differences are exaggerated and large values seem to be closer to 100% than they really are. Don’t do this. (3) The visual theme is distracting: I suspect the NYT Magazine graph is intended to look like some sort of food. Pieces of a pie? Cake? Cheese? It doesn’t work. This does. Unless you are evaluating the Pillsbury Bake-Off, however, it is probably not an appropriate theme. (4) Visual differentiators add noise: Graphs must often differentiate elements. 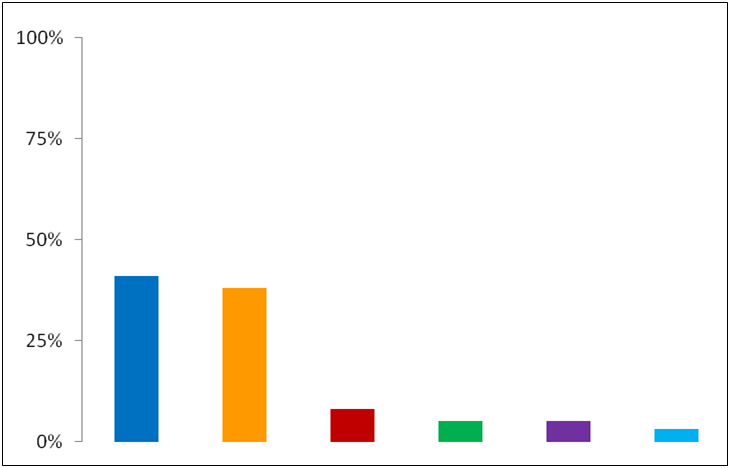 A classic example is differentiating treatment and control group averages using bars of different colors. In the NYT Magazine pie chart, the poor choice of busy patterns makes it very difficult to differentiate one piece of the pie from another. 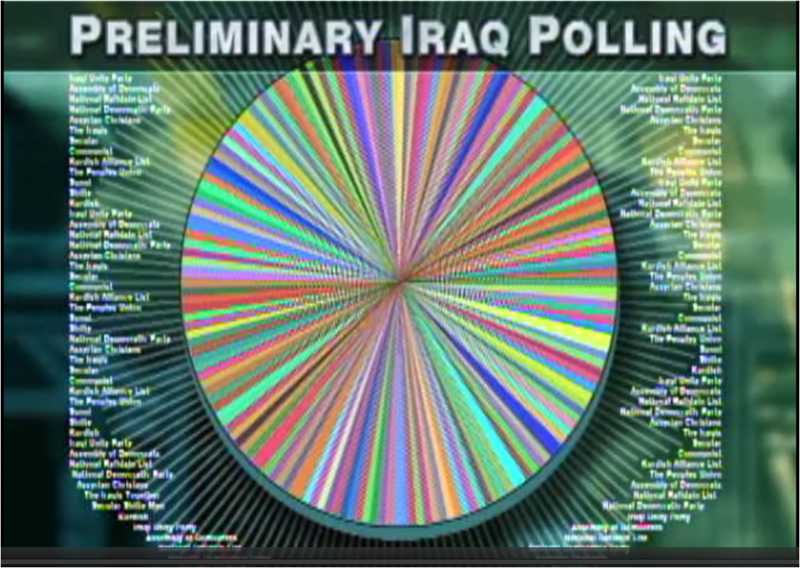 The visual chaos is reminiscent of the results of a “poll” of Iraqi voters presented by the Daily Show in which a very large number of parties purportedly held almost equal levels of support. (5) Data labels add more noise: Data labels can increase clarity. In this case, however, the swarm of curved arrows connecting labels to pieces of the pie adds to the visual chaos. 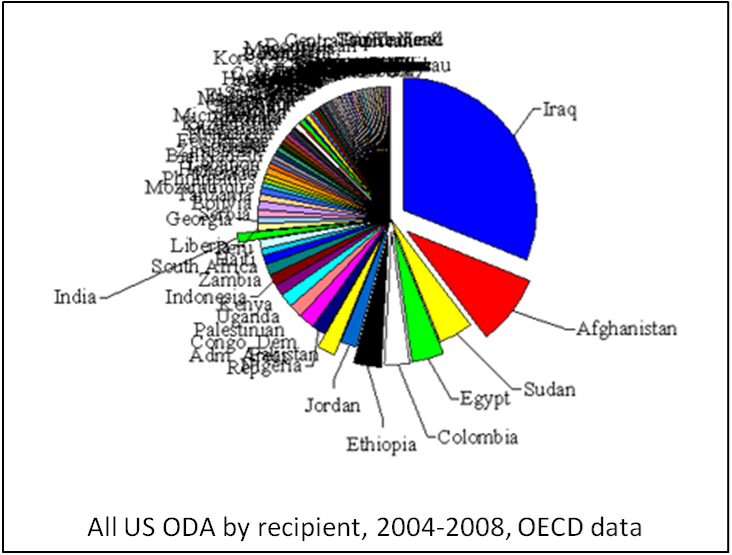 Even this tangle of labels is better because readers instantly understand that Iraq received a disproportionate amount of the aid provided to many countries. We investigated whether the type of data display (bar chart, pie chart, or table) or adding a gratuitous third dimension (shading to give the illusion of depth) affects the accuracy of answers of questions about the data. We conducted a randomized experiment with 897 members of the American Life Panel, a nationally representative US web survey panel. We found that displaying data in a table lead [sic] to more accurate answers than the choice of bar charts or pie charts. 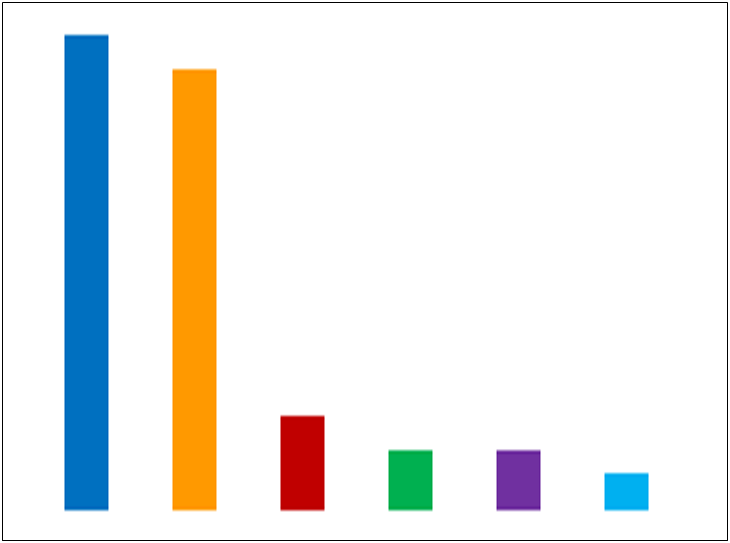 Adding a gratuitous third dimension had no effect on the accuracy of the answers for the bar chart and a small but significant negative effect for the pie chart. There you have it—empirical evidence that it is time to retire the pie chart. Alas, I doubt that the NYT Magazine, infographic designers, data viz junkies, or anyone with a reporting deadline will do that. As every evaluator knows, it is far easier to present empirical evidence than respond to it. Excellent and thank you! 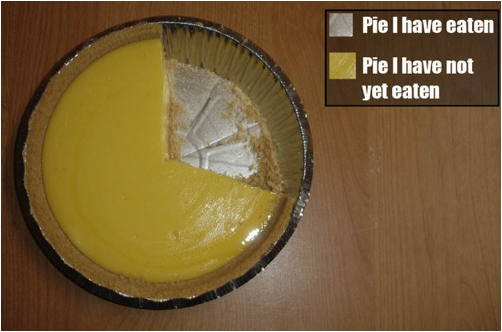 I am piechart averse but, as a newbie on the AEA LinkedIn discussion, try to be nice in my comments. I think I have to add a deeper puzzlement about the example from Tara PP and NYT: the 1047 responses to the Tara’s article appear to have been scored in to mutually exclusive categories (totaling 100%). Not bloody likely that such a scoring rubric allows for accurate representation of the respondents full sentiments. Else, a “total” should not be calculated, and should certainly not “add up to” 100% — which is a dead giveaway that a pie chart is an inappropriate choice for presentation. You win the visualcy prize for noticing the impossibility of mutually exclusive categories. In an early draft, I went into painful detail about that, but later decided I was flogging a dead horse. The categories are almost certainly not mutually exclusive. Moreover, the second largest category (38%) is *miscellaneous*. Whatever data coding scheme was used, it failed to categorize almost 4 out of every 10 responses. So yes, there is a deeper problem–bad data–and that always leads to bad visual representations. You are so entertaining and informative. Not sure about the word visualcy. How about visualtude? 🙂 There was one context where I used a pie chart and thought it worked fairly well…in showing reasons why children were exempted from immunization at Kindergarten enrollment. The slices for “medical” and “religious” reasons were so tiny that the “personal” exemption reason took up the majority of the pie and made a fairly dramatic statement. Not sure I would exchange this pie chart for another graphic. Literacy. Numeracy. Visualcy. It’s a matched set. What’s not to like (other than the difficulty of pronouncing the word)? You comment brings up two great points. (1) The bigger the effect, the less important the choice of graph. Big effects are easy to see, so the noise imposed by a graphic is not very important. Small effects, however, may be hidden by one type of graph and made obvious by another. (2) The best graph is the one that accurately communicates your point to your audience. Unfamiliar but technically superior graphs may, at times, alienate audiences. We need to speak the language of our audience. I am suggesting that it is in our best interest to develop a more effective and commonly understood visual language.